If you are looking for excitement, Go for the Apache..
Guys who might buy this cheap/economical bike are either in villages or they certainly don't surf the internet. But 20,000 (max 24,000-25,000) rupess, for guys with small income sounds might just work for them. The Company whose sales might take a hit more than anyone else is Hero Honda. 100 cc sales are the ones which brings in the volumes for Hero Honda. I say it once more the Dics are Ok.. Improvements can be.. Yes, Black Color, at least the alloy wheels would be great. Also better designed rear view mirrors and rear grab rail should be included. Maybe a new design along with an All new tank as well..!! Maybe someone was attached in the night by goons.. so maybe for self defence he grabbed at the nearest chain he could lay his hands on..!! 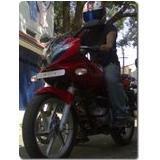 I have ridden the 125 cc XCD as well. The seat of the XCD is as high as any other 125 cc bike. It is just that the XCD has been made to look small. No probs for small people on the XCD as well. Its just that the XCD doesn't have that sporty feel and feels like a commuter (which it actually is). I take a lot of test rides and write about it on my blog.. if anyone is interested, he can check it out.. I am 5 ft 5 too..!! The best bike for you would be the Apache RTR 160... When I took the test ride of the RTR.. I instantly felt as if I had been riding the bike since a long time.. its perfect for small guys like us.. Also almost all 100-125 cc bikes would also suit your size well. Can anyone educate me on the Origin of the word "Cafe Racer"..?? What does a "Cafe Racer" actually signify..?? No problems from my side whatsoever.. The rear are good enough to cut speed.. Coupled with the execellent front Disc brake, the Braking has been no problem at all..